Just hitting the one-third mark of the Ontario Junior Hockey League regular season schedule, the Aurora Tigers remain the kings of the jungle. lead atop the North division standings. The week kicked off Friday with a hosting of the lowly Georgetown Raiders at the Aurora Community Centre, a surprise bottom feeder in the West after reaching the Dudley Hewitt Cup final last season. To no one’s surprise, it was newcomer Ryan Littlejohn that opened the scoring early in the first, acquired in a trade with the Trenton Golden Hawks late last month. A powerplay wrister from the point extended the forward’s scoring streak to four games. League-leading scorer Joseph Mizzi continued his torrid pace by taking advantage of a turnover just a few minutes later, finishing off a wraparound to put Georgetown in a hole early. Georgetown solved goaltender Christian Filippetti for the first time just past the midway mark of the period, a rebound opportunity he had no shot at, before Landis Atonic caught a lucky break by banking a pass in off a defender to give Aurora a 3 – 1 lead after one period. Two straight Georgetown goals tied the game at four late in the third period, giving Aurora’s Jack Varga the opportunity to play the hero off a one-timer from a threaded pass by Mizzi with under five minutes to go. 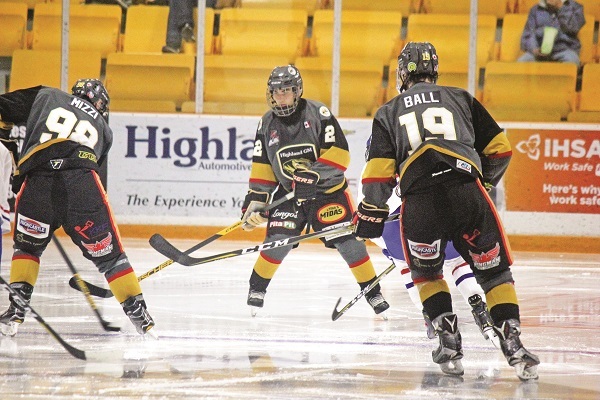 Jacob Ball added an empty netter with two seconds on the clock for the 5 – 3 win. Aurora returned to the ice for their annual “Pink in the Rink” game Saturday to host the Pickering Panthers, a junior hockey initiative implemented across Ontario last week to support breast cancer awareness month. The visual change certainly did not affect their ability to find each other on the ice, yet may have been a distraction for the Panthers, with Jack Irvine earning his first shutout of the season between the pipes in a 4 – 0 win. Ball, Mizzi, Tyler Davis, and Kyle Bollers all found the back of the net for the Tigers, while the win was Irvine’s fourth in the last five games. With Markham managing just one point in a tie with the Newmarket Hurricanes on Sunday, the division rivals are now miles apart in the standings, with Aurora leading the way at a record of 13-4-2-0. Mizzi, now in his second full year with the club, continues to pace the league lead in scoring with fourteen goals and twenty assists, currently riding a nine-point streak in just his last four games. He’ll look to keep filling the back of the net on Friday when the home streak continues, hosting the Brampton Admirals (formerly Orangeville Flyers) at the Aurora Community Centre. Puck drop is set for 7:30 p.m. The Tigers can stretch their North division lead even further with a win over Markham on home ice Saturday.